These Customized Magnetic Tic Tac Toe Game Sets are great for promotional giveaways, gift shops, and more. Each Custom-Imprinted Magentic Tic Tac Toe Game can be customized with a logo or message on the game cover. Each Tic Tac Toe Game comes nicely packed in a handsome silver gift box. 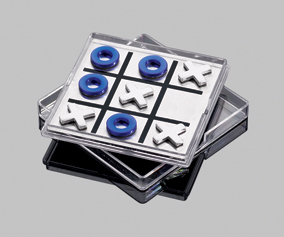 This Custom Magnetic Tic Tac Toe Game measures 4¼" wide x 4¼" long x 9/16" high.